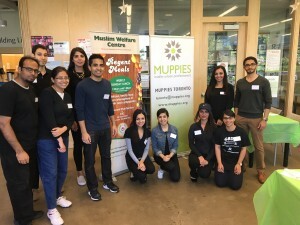 Muppies Toronto hosted its first community volunteer event this summer! We invited our members to participate in the Muslim Welfare Centre’s “Regent Meals program,” which is a free lunch service in Toronto’s low-income neighbourhood of Regent Park. Muppies volunteers arrived bright and early on a Sunday morning during Ramadan, ready to expend their time and efforts giving back. Everyone was eager to pitch in, and we worked together as a team. Some of our tasks included setting up the room, greetings patrons as they arrived (members of the community receive a free meal on a walk-in basis), taking orders and serving meals in restaurant style, filling beverages, and cleaning. It was very busy and sometimes hectic as we zipped around throughout the two-hour lunch service, but it was well worth it: Together, we managed to feed 312 people! It was humbling to see first hand how many people in the community are in need of a basic meal. They came from all walks of life; young and old, of all different nationalities and ethnic backgrounds. It was especially touching to see a new immigrant family, consisting of a single mother and her six children, arrive for lunch. Another little girl sat quietly in her mother’s lap as she was fed her portion of the meal. It became clear that poverty doesn’t discriminate, and by fasting, we were able to further remove a barrier between ourselves and the hungry patrons we were serving. Serving the needy connects directly to the spirit of Ramadan, and the day was truly fulfilling and rewarding for our group. If you feel inspired and would like to donate to help fund the Regent Meals program, please visit: https://www.muslimwelfarecentre.com/how-you-can-help/donate/. It costs $2,400 to run one Sunday lunch service, so every donation is deeply appreciated. What is the Muslim Welfare Centre? The Muslim Welfare Centre (MWC) was established in Toronto in 1993 with the slogan: “Service to humanity is service to Allah.” The MWC runs programs such as food drives, halal Meals on Wheels, and a free medical clinic, as well as the well-known “Project Ramadan” initiative, which provides food hampers to families in need during the month of Ramadan. What is the Regent Meals program? MWC has been running the Regent Meals program in conjunction with the “Christian Resource Centre” since 2014. The program provides a free halal meal to patrons every Sunday (regardless of religion, income, ethnicity, or any other factor) and is a great example of productive local engagement and successful collaboration between Muslim and Christian groups. Volunteers are welcome every Sunday!